The Active sites page of the new SharePoint admin center lets you view the SharePoint sites in your organization (including the new communication sites and sites that belong to Office 365 groups). It also lets you sort and filter sites, search for a site, and create new sites. The Active sites page lists the root website for each site collection. Subsites aren't included in the list. Some functionality is introduced gradually to organizations that have opted in to the Targeted release option in Office 365. This means that you may not yet see this feature or it may look different than what is described in this article. To manage sites in the new SharePoint admin center, go to the current SharePoint admin center, click "Try it now" in the upper right, and then select Active sites. For info about the new SharePoint admin center, see Get started with the new SharePoint admin center. 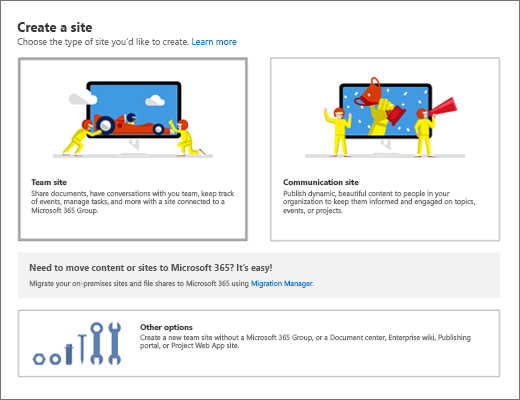 Select to create a team site (which will create an Office 365 group) or a communication site. To create a classic site, or a new team site that doesn't include an Office 365 group, click Other options. 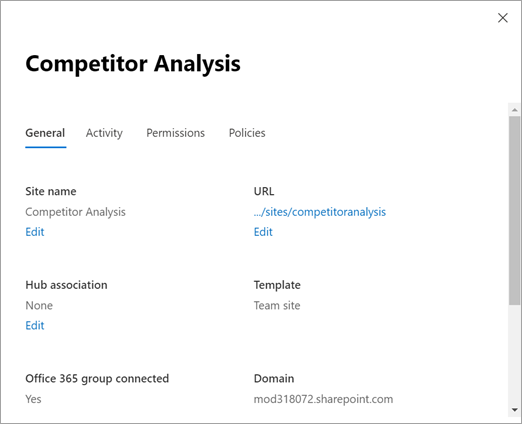 For info about the new site templates, see Create a team site in SharePoint Online and Create a communication site in SharePoint Online. Global admins and SharePoint admins can now delete sites that belong to an Office 365 group. Deleting these sites will delete the group and all its resources, including the Outlook mailbox and calendar, and any Teams channels. Click Delete, and then click Delete to confirm. You can recover deleted sites for 93 days. For more info, see Restore deleted sites. Note that deleted groups must be restored within 30 days. Click Owners. For a group-connected team site, you can add and remove group owners. For other sites, you can change the primary admin and add and remove other admins. Note that if you remove a person as a primary admin, they will still be listed as an additional admin. Select an option, and then click Save. The options that are available depend on the organization-wide setting you've selected. The setting for a site can be more restrictive, but not more permissive. To see more info about a site, click the site name to open the details pane. All these insights are available as columns in the site list. 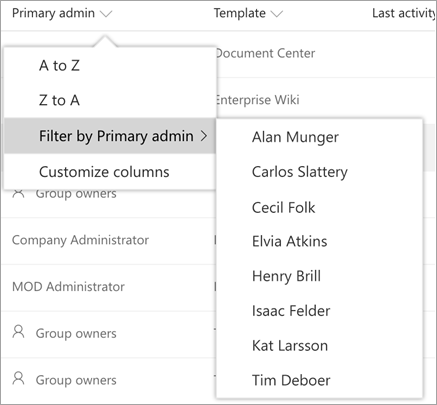 For info about adding a column that doesn't appear, see Customize columns. The primary admin (also available as a column in the site list) and additional admins, with links to change the admins. If a site belongs to an Office 365 group, you can change the admins by changing the group owners. Sorting and filtering the site list is just like sorting and filtering other lists in SharePoint. Click the arrow next to the column header. Select how you want to arrange the items. The options vary depending on the column. For example, you might have options to sort alphabetically, in numeric order, or chronologically. If the column allows filtering, you'll see a "Filter by" option. Select the value or values that you want to show. Your selections will appear with a check mark beside them. To remove a selection, click that value again. To clear all filters on the column, select Clear filters. You can search for a site by name, URL, primary admin, or template. To do this, enter keywords in the Search box and press Enter. Search doesn't look in hub site display names for the keywords you enter. All characters you enter are treated as part of the query. Search doesn't recognize operators or wildcards (*). To export your list of all sites as a .csv file that you can work with in Excel, click Export. The Export command exports all sites and includes all columns, even if your current view is filtered. Click the arrow next to any column header, and then select Customize columns. Select and clear check boxes to show and hide columns. Rearrange the columns by pointing to a column and clicking the up or down arrow to move the column up or down. 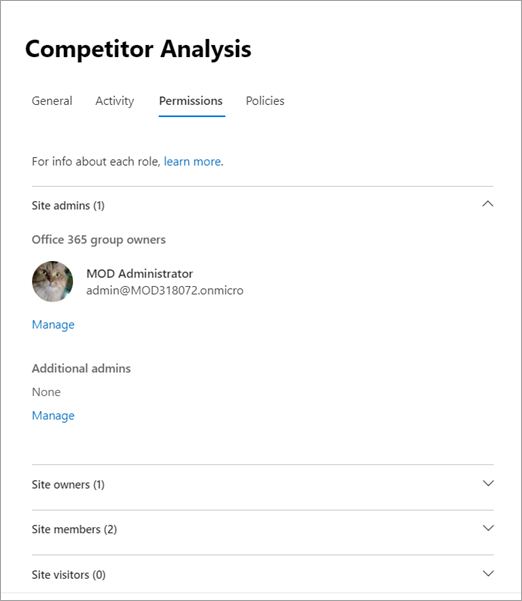 The new SharePoint admin center comes with a few built-in views: Office 365 group sites, Sites without a group, Largest sites, Least active sites, and Most popular shared sites. You can also create and save custom views. On the far right of the command bar, next to the Search box, click the View drop-down (the name changes depending on your current view). In the Save as dialog box, enter a name for the view. To set the view as default, in the View drop-down, click Set current view as default.